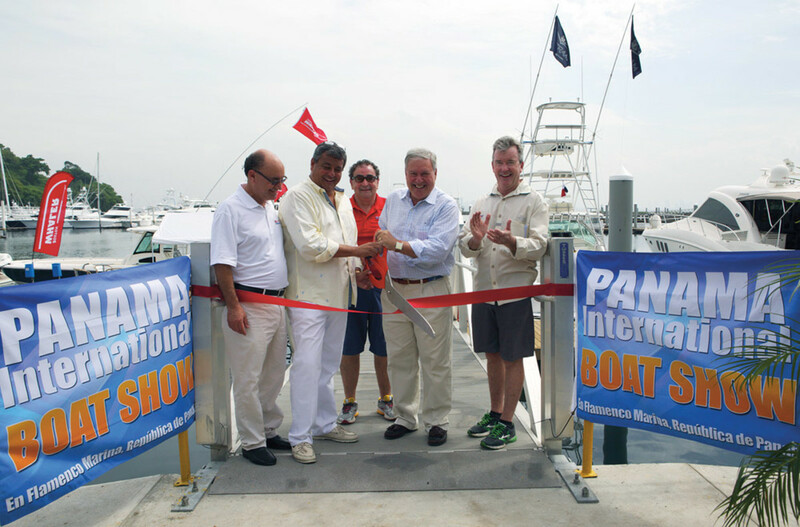 (From left) Ricardo Strul, Miguel Pineiro, Dane Graziano, Efrem "Skip" Zimbalist III and Andrew Doole cut the ceremonial ribbon at the inaugural Panama International Boat Show. It’s always good when the motorcade arrives, and at the inaugural Panama International Boat Show that moment came when the country’s president, Ricardo Martinelli, paid a visit. Doole says he was pleased with the manufacturer presence and the support from local dealers who displayed at the show, which was held June 20-22 at the Flamenco Marina near downtown Panama City. Visitors traveled from various regions in Panama, and from Colombia and Venezuela. “It created a lot of awareness around the city. And it’s always good when a motorcade arrives,” Doole says of Martinelli’s appearance, emphasizing that the presidential visit strengthened interest in Evermarine. Doole says all of the exhibit space on land and in tents was sold out. “I think [exhibitors] are surprised and happy to see the way the tents are set up,” he says. “We brought them from the United States, and they’re floored and carpeted. We’re happy and proud of this show. We’ve got boats in the water that range from 30 to a couple hundred feet. So it’s a good cross-section, and a lot of sportfish boats. A VIP event at the marina featured fireworks. Sponsor Mercedes-Benz was pleased with the event and the show, Doole says. There was also excitement among locals, according to Gonzales, who says he heard buzz at the airport and in cabs about the new event. A VIP kickoff on June 19 helped generate more chatter. Show Management will meet with exhibitors and Flamenco Marina owners to determine the dates of next year’s show. Already organizers say they want to open and close the show later in 2015.